The Monticello is a Colonial Revival with just over 1900 square feet, a huge reception hall, and three large bedrooms. 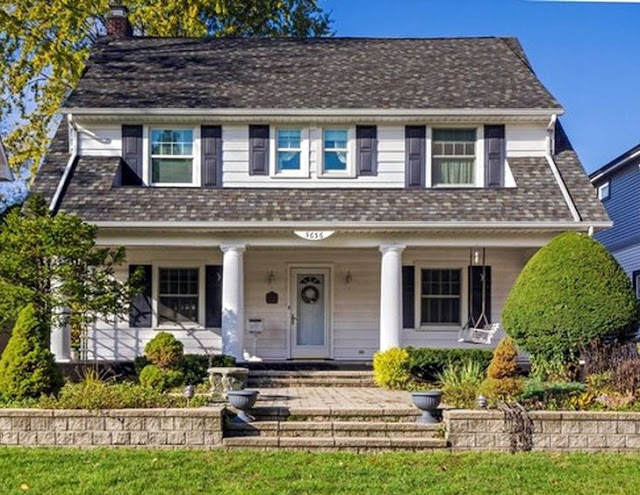 The house in Norwood Park is a reverse plan. 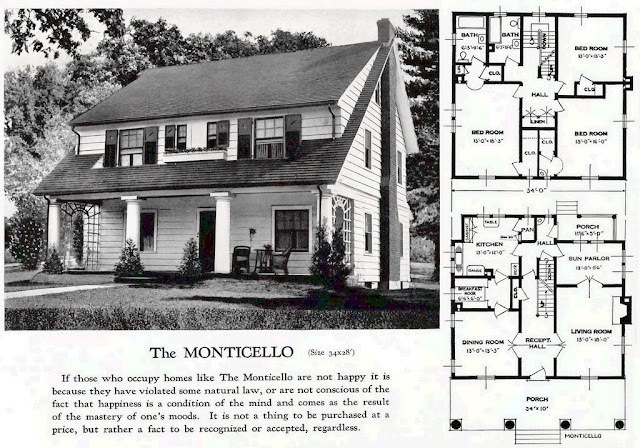 According to the Standard Homes plan book, "If those who occupy homes like The Monticello are not happy it is because they have violated some natural law, or are not conscious of the fact that happiness is a condition of the mind and comes as the result of the mastery of one's moods. It is not a thing to be purchased at a price, but rather a fact to be recognized or accepted, regardless." I'm not sure I understand all that, but whatever. The architect of the Monticello was Lyman J. Allison, a noted bungalow architect in Chicago. The Monticello on Newark was built in late 1928 or 1929. The original owners were likely Leon M. Farnum and his wife Jenny. They lived in the house in 1930, along with their daughter, son-in-law, and grandchild. Leon listed his occupation as "dentistry general practice" and also "teeth carver" (ugh!). The Farnums were in the house until at least 1940. I'm not sure about the advertising claims but the Monticello Is a beautiful house. I fell in love with one on Crescent Ave. in Hopewell Va. I tried to buy it from friends that owned it but they didn't want to move. I was disappointed at the time, I guess I hadn't mastered my moods yet?